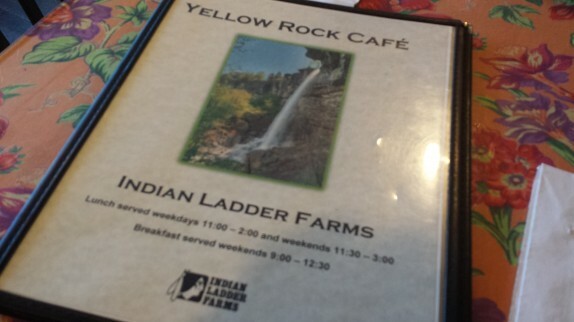 Given that Indian Ladder Farms was the site of our wedding reception, it holds a very special place in our hearts. 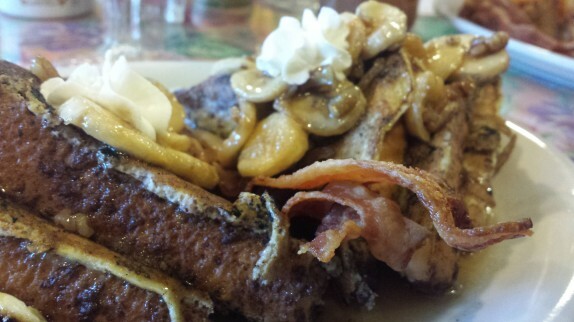 Cassie recently had the idea to have breakfast at the little cafe inside of the farm, The Yellow Rock Cafe. 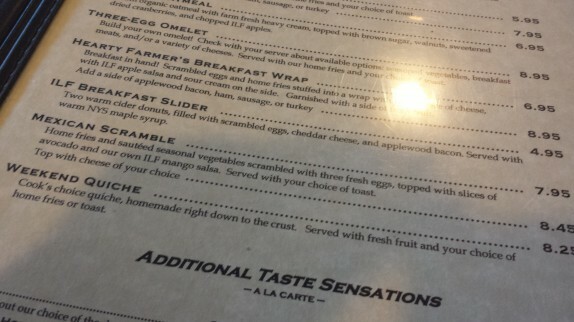 I wanted to order the ILF Breakfast Slider so bad. According to the menu, it’s two warm cider donuts, filled with scrambled eggs, cheddar cheese, and applewood bacon, served with warm NYS maple syrup – $4.95. I didn’t go that route because I figured, based on the price, I’d feel the need to order something else just to give myself the impression that I ordered enough food. So I settled on the Country Weekend French Toast (The cook’s farm kitchen creation: Made from freshly baked bread soaked in egg batter and layered with seasonal fresh fruit, baked to golden-brown perfection then topped with homemade whipped cream and served with pure maple syrup, fresh fruit and your choice of either applewood bacon, ham, or sausage – $8.95). Once we placed the order, I found something else on the menu that was intriguing. It was called a Shrub (A colonial era beverage made from fresh fruit, vinegar, organic cane sugar, and spices mixed with sparkling water and your choice of raspberry, strawberry, or ginger flavoring, served over ice – $2.50). 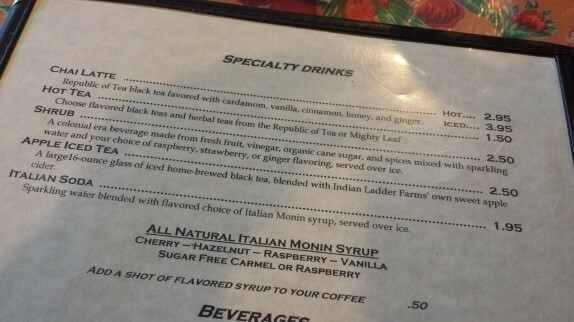 I’ve been big on having ginger juices in the morning, so while not exactly the same, this was right up my alley. It was basically a soda with a kick. There was a big background of vinegar in there, and the ginger syrup was also really strong as well. 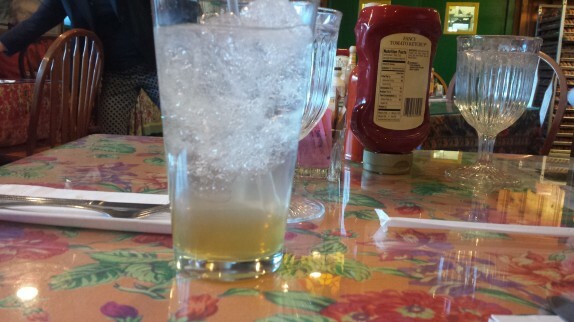 It was a fairly thick and heavy drink that lost a lot of the bubbliness upon agitation, but it was delicious and sweet. 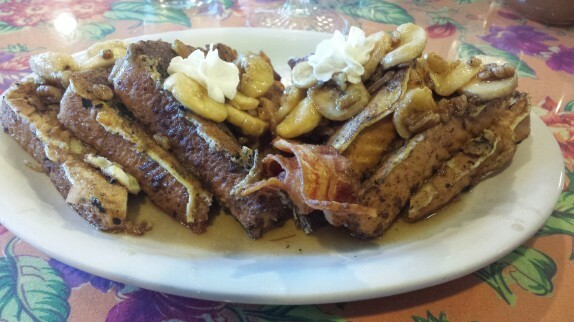 The Country Weekend French Toast that day was bananas foster themed; it had bananas cooked in brown sugar and bourbon, toasted pecans, and to round things out, a decent amount of real maple syrup. The serving was fairly hefty, with three full slices of white bread making the base of the dish. I liked that they didn’t oversoak the bread in the egg custard prior to frying, as the center of the bread was slightly dry and spongy (my preference for pan fried French toast). The bacon was pretty good and provided a couple of salty bites to counteract the very sweet breakfast. 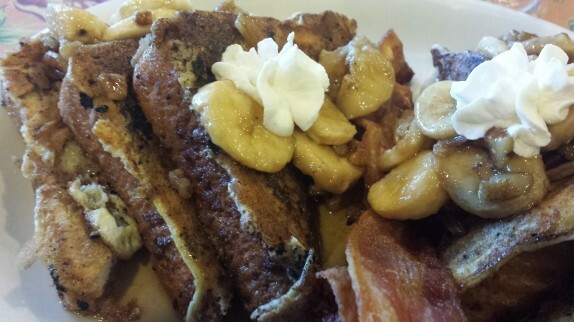 The bananas and pecans really made the dish special. Service was pretty quick that morning. We ordered about 5 minutes after we were seated, and the food didn’t take more than 15 minutes to arrive after ordering. On the way out, we picked up our obligatory cider doughnuts and munched on those throughout the day. 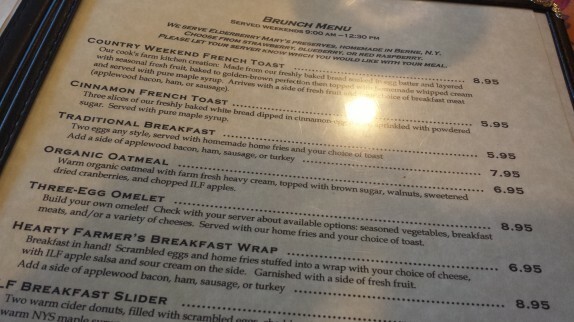 I love it when their french toast special is the berries and mascarpone, so delectable !